Our National Forests are an important part of the land we all share. Did you know that there are many campsites sprinkled all over our National Forest lands, in some of the most beautiful parts of the country? Not only that, but if you’re the kind of camper who likes to rough it, you can camp throughout many undeveloped areas of the forests for free. It’s land that belongs to us, the citizens of the U.S., so if you like to hike, camp, fish, hunt, ride ATV’s or rock climb, your National Forest is a treasure of opportunity. It belongs to you, don’t miss the chance to visit and enjoy. 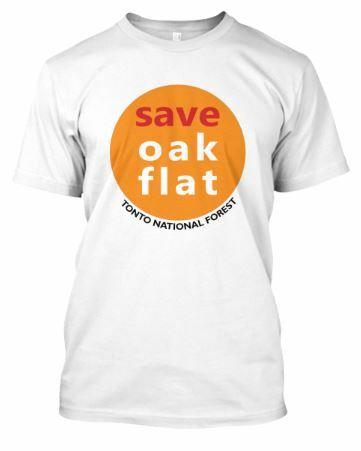 Save Oak Flat TShirts help keep the Walk to Save Oak Flat rolling forward. Show your support and spread the word at the same time. Choose your favorite color and let everyone know you support the effort to keep our National Forest lands protected. Click here to place your order, and thanks for your support.